In HoudahSpot, snippets let you to set aside frequently used combinations of search criteria. HoudahSpot comes with a few pre-installed snippets, but you can also define your own. Snippets can hold a single search criterion or a group of criteria that serve a certain purpose. The pre-installed snippet “Date Created range”, for example, holds two criteria in an “All of the following are true” group: “Content created before” and “Content created after”. Use this snippet whenever you want to find files created in a range of dates. There are many ways to use a snippet. You can, for example, drag it from the sidebar to the refine pane to add its criteria to the current search. To create a new snippet, select the criteria rows that make up your snippet in the Refine pane. Then either use the “Save as Snippet” command from the Search menu or make use of the context menu (ctrl-click). To select the criteria rows more easily, hold the option key while you click. To create a snippet, you can also drag the selected criteria rows to the Snippets preferences pane. Preferences can be accessed from the HoudahSpot menu. 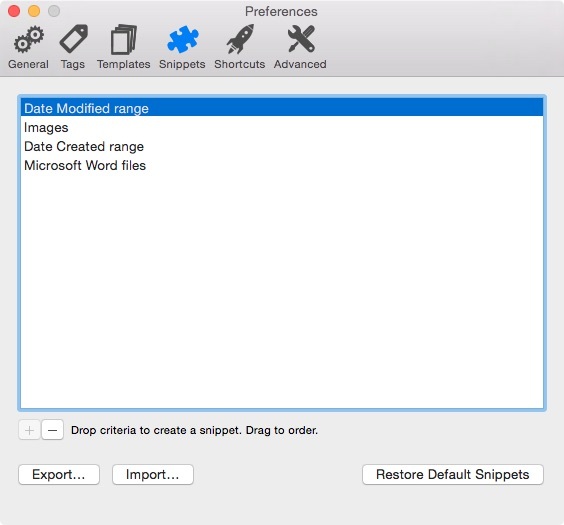 The Snippets preferences pane also allows for deleting, exporting or importing snippets. To save more complex query setups, you may want to use templates or saved documents. See “Save Queries for Recurring Searches“.